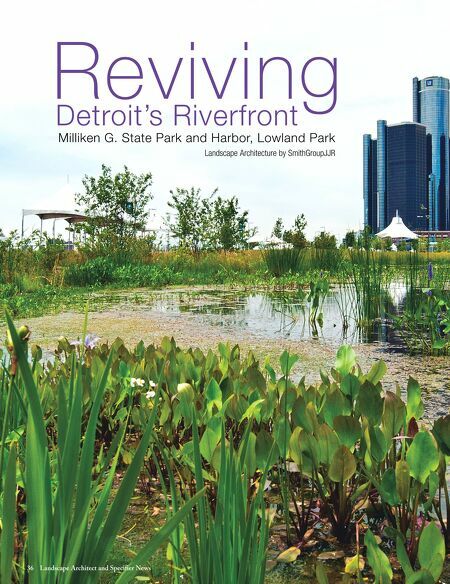 March 2015 37 The second phase of Detroit's Milliken State Park includes a wetlands demonstration area that showcases nature's water filtration. Collected stormwater passes through a swirl separator to remove suspended solids, oil and grease. The stormwater is then pumped into a four-foot deep sediment forebay, which allows additional sediment to drop out before entering three-foot deep pools with emergent plants. Finally, the water passes through 18-inch deep braided wetland streams to increase vegetation and stormwater interaction for maximum filtering, before passing over a weir and entering the river. 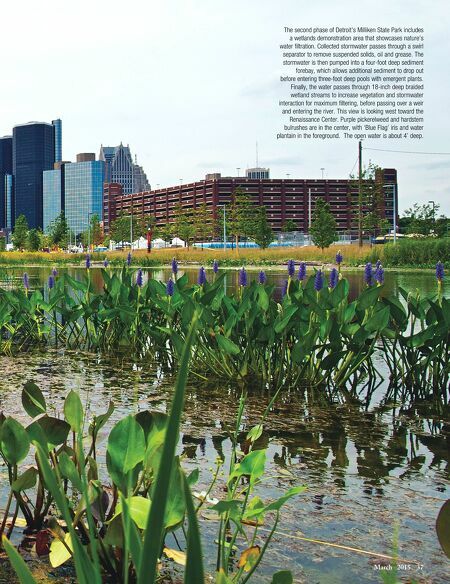 This view is looking west toward the Renaissance Center. Purple pickerelweed and hardstem bulrushes are in the center, with 'Blue Flag' iris and water plantain in the foreground. The open water is about 4' deep.